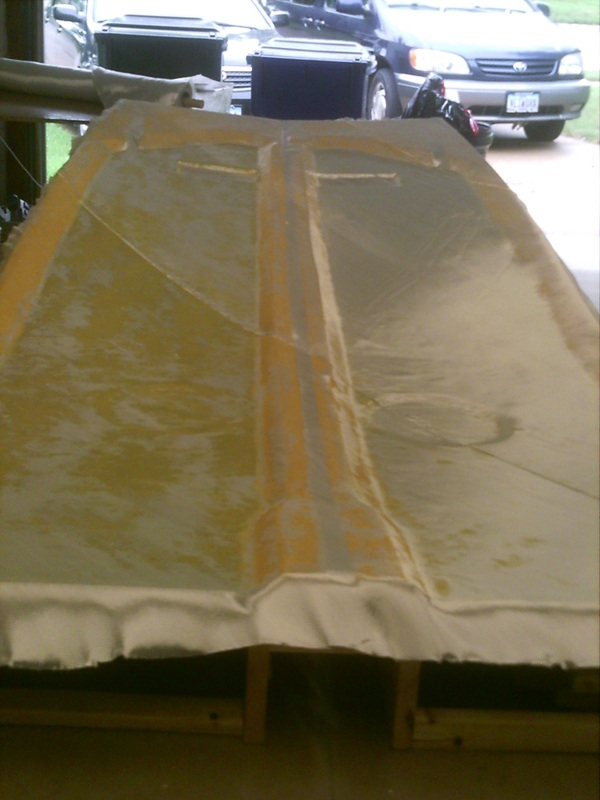 Due to not having my UND Fiberglass issues tended to yet (as of 7/16), I have been working on tying up some loose ends and working ahead. I added some spacers to the jigs to get the top longeron edge straight. I had noticed when I put the spacers in, they were really loose in the center section. I also test fit the lower longerons, and cut the relief cuts as necessary. 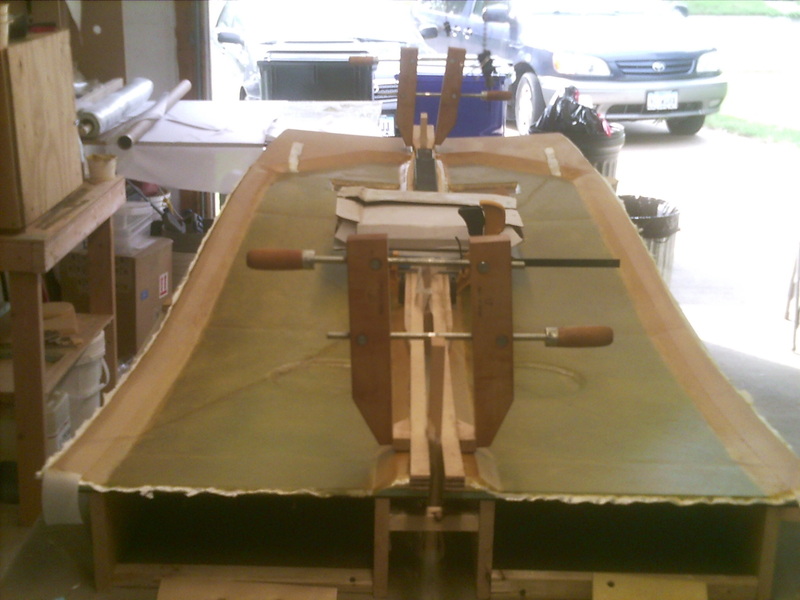 Started the fuselage sides this morning (7/23). Micro’d all surfaces, adding micro to the edges for a smooth transition. John Tvedte showed up to help, as well as Kim. Two layers of glass at 30 degrees and floxed the longerons on. Peel ply’d the edges, and I’m spent! Doesn’t sound like a lot of work reading the description, but believe me that it was. 9hr day, and a good job done! Completed the afternoon before leaving for Airventure 2011! Removed the peel-ply and sanded the area where the next layers will connect to. Trimmed the edges and sanded the corners of the longerons for the glass to lay over, which will also double as a softened corner for the shoulders when sitting in the cockpit. Sanded out the fuel gauge depression, but it looks like I may need to fill in a few air bubbles in the corners. 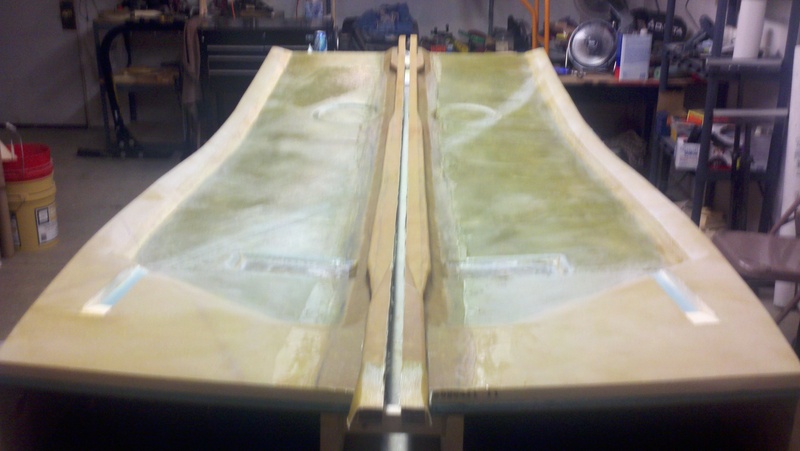 Glassed the longerons already attached to the fuselage sides. Used the method described to me by Randi of the Cozy Girrrls, of making the glass tapes by laying 2 layers of dry glass on tin foil, and marking center lines in the X & Y axis on the foil. 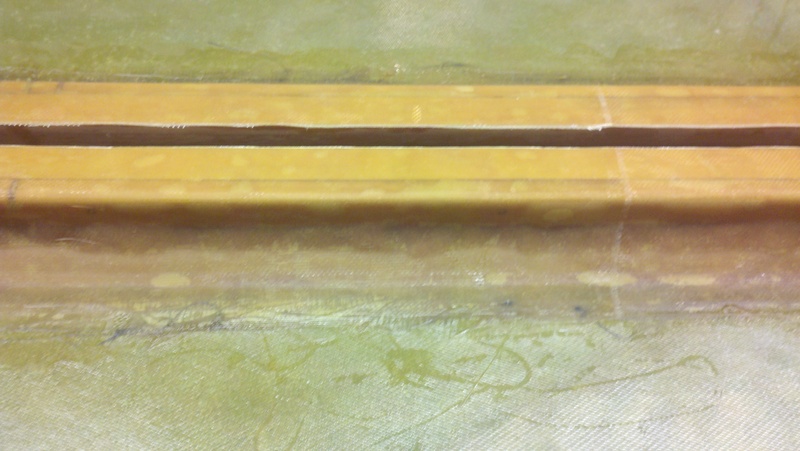 Add epoxy thick to soak between layers, then add 2 additional layers of glass and repeat wetting the cloth. The piece was too large to manage by myself, then I remembered Randi’s “Scroll” method she described, where you take an empty roll on each end of the tin foil, and roll each side under until it gets to the center mark to form a “scroll”. As it turns out, since the glass has to travel a larger distance around the roll than the foil does, and the glass won’t stretch, the foil buckled from the stress and caused several air bubbles in the roll. 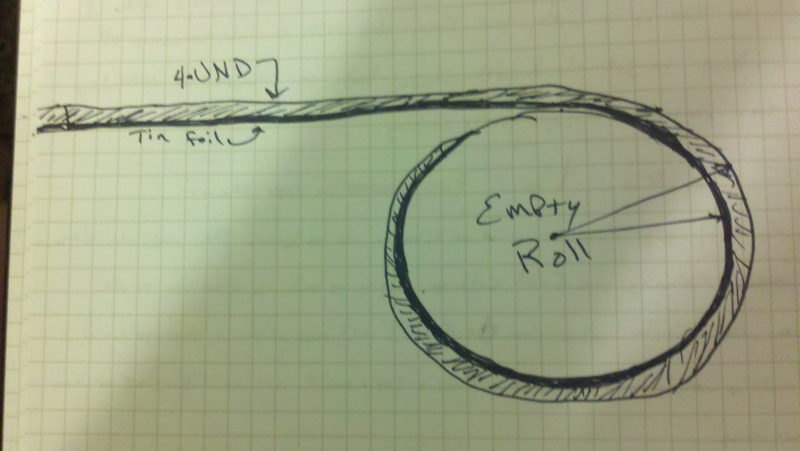 I was committed, so I pressed on, figuring I could work out the air bubbles after I got it transferred to the longerons. I added flox to the corners, and wet the wood longerons with a light layer of epoxy, and stippled out all the air bubbles. It was hard to keep the air bubbles at bay, but they finally gave way to my persistent stippling. Added peel ply the best I could around all the odd c orners and let cure. I ended up with some air bubbles and wrinkles in my peel ply, but I was not too concerned about that, as I could sand those areas after curing. After cure, I knife trimmed and removed the peel ply, only to find all my air bubbles had returned. I’m assuming that either I misunderstood something in the process that Randi explained, or this process only works with BID tapes (and not UND). My guess is the latter is true. Sounds like Ron will be stopping by tomorrow to take a look at the layup, and we will decide the next course of action then. Stay tuned! This entry was posted in 05. Fuselage Sides. Bookmark the permalink.